Excerpt: Everybody knows or has heard of a poem written about the microscope, microscopy or microscopic specimens. These are not new, but I have a few — which few have read — contributed by students and written on pages in microscopy notebooks used in the classrooms of McCrone Research Institute. 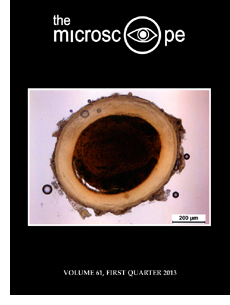 Abstract: Circularly polarized and circularly analyzed light for microscopy with a white light source remains underutilized, even though circular polariscopes using this same kind of illumination date back to the early 1800s. Possible reasons for this delay in application to microscopes are as follows: an emphasis on microscopes with linear polarizers and analyzers, spurious interference colors associated with early chromatic quarter-wave plates, significant applications that did not develop until the late 1800s, and problems with the earliest quarter-wave rhombs. Fresnel rhombs in the earliest polariscopes deflected the beam laterally, restricted the field of view, and caused large retardation errors for obliquely incident rays. By contrast, the Mooney rhomb, which was not invented until 1952, would, with dielectric films on its faces, produce much smaller retardation errors, and in an inverted microscope such a rhomb would doubly serve to deflect the beam to a convenient viewing angle. In an upright microscope, an inline prism known as a modified AD-1 device could provide highly broadband circularly polarized light if combined with an achromatic quarter-wave plate in the accessory slot. Both transmitted and reflected circularly polarized light is possible with these optical elements, providing many applications for photomicrography and image analysis. Excerpt: Creationists and I al ways get along really well. They sometimes come up to me after a lecture. “Let’s face it,” they say, “we are at opposite poles of thought. You believe in evolution, while we are certain that God created everything.” At this point I peer over my eyeglasses. “God created everything?” I ask and then, when they nod excitedly, I respond, “Then we are reconciled. If God created everything, then he created evolution.” Case closed. Abstract: Electron backscatter diffraction (EBSD) is a crystallographic technique that, when used in conjunction with scanning electron microscopy (SEM) and energy dispersive X-ray spectroscopy (EDS), can allow for the rapid identification of a crystalline phase using both compositional and structural data. SEM/EDS alone is limited as a tool for phase identification by the inability to collect useful crystallographic information from an unknown specimen. Most EBSD work is performed on carefully prepared polished samples. It is possible to use EBSD on powdered specimens, individual crystals (up to several millimeters in size), or by crushing and/or grinding a sample to achieve a particle size in the range of 5 mm – 100 mm. In a matter of minutes a sample can be prepared that is capable of providing high quality electron diffraction patterns and compositional data suitable for phase discrimination. When compared to the effort of polishing a bulk specimen, the methodology presented here provides several advantages. The main advantages of preparing a sample as a particulate is speed and the ability to precisely select phases of interest from a hand sample or thin section. The sample preparation methods described are applied to two case studies for the identification of unknown materials and to demonstrate the potential for the method in the field of asbestos fiber identification.